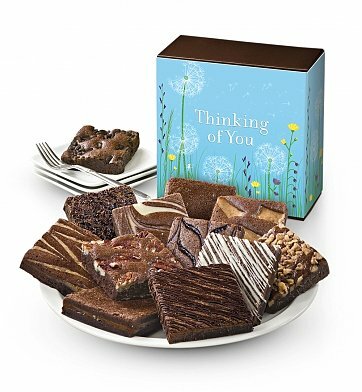 A dozen decadent chocolate brownies in twelve flavors is the perfect way to send your best wishes. Hand made from fine Callebaut Belgian chocolate and all natural ingredients, these brownies come in a variety of enticing flavors and arrive in a thinking of you gift box. One Dozen All Natural Gourmet Brownies. 12 Rich Flavors like Double Chocolate, Caramel, Walnut, Toffee Crunch, Cream Cheese and Raspberry Swirl. Thinking of You-Themed Gift Box. Each premium brownie is individually wrapped for freshness and arranged in a perfect thinking of you-themed gift box. if ordered by 1:00 pm EDT Sunday April 21st. One Dozen Thinking Of You Brownies is a hand delivered gift. These gifts are delivered by one of our local design centers located throughout the United States and Canada. Same day delivery is available for most gifts when ordered before the cutoff time. The cutoff time for One Dozen Thinking Of You Brownies is 10 AM in the recipient's time zone. Each brownie is individually wrapped to ensure freshness. Crafted by artisans in the USA using only the finest ingredients. Certified Kosher, all natural, free of trans fats, artificial colors and preservatives. Recipient was thrilled to receive it and said they were absolutely delicious. These were delivered to a patient in a nursing home. They found the quality outstanding. They were very happy with them. I have sent these to several people for various occasions and I always get the same response - Yummy! Everyone loves them!